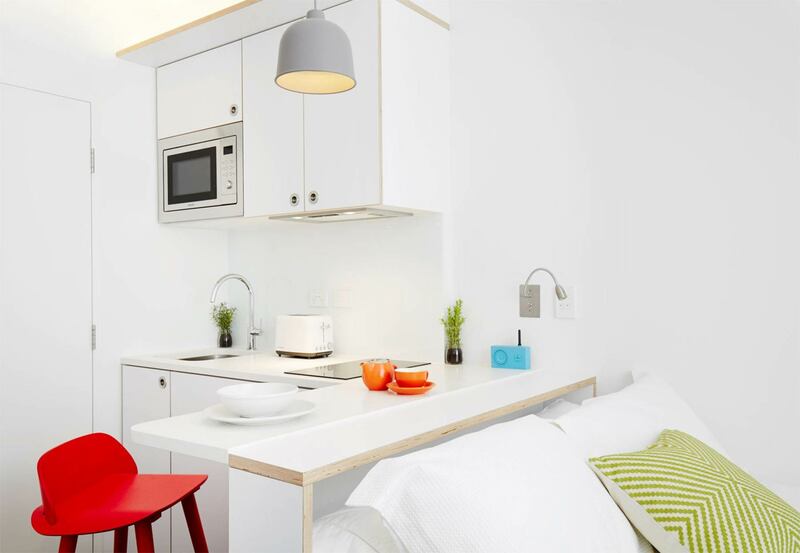 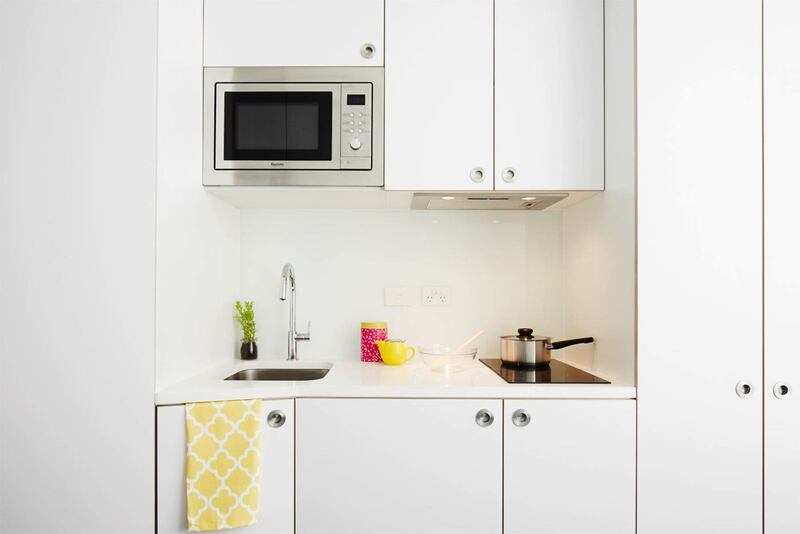 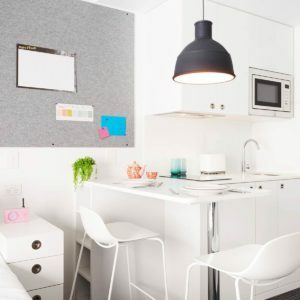 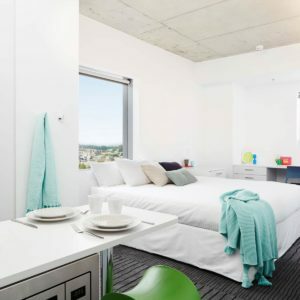 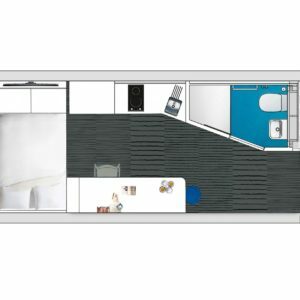 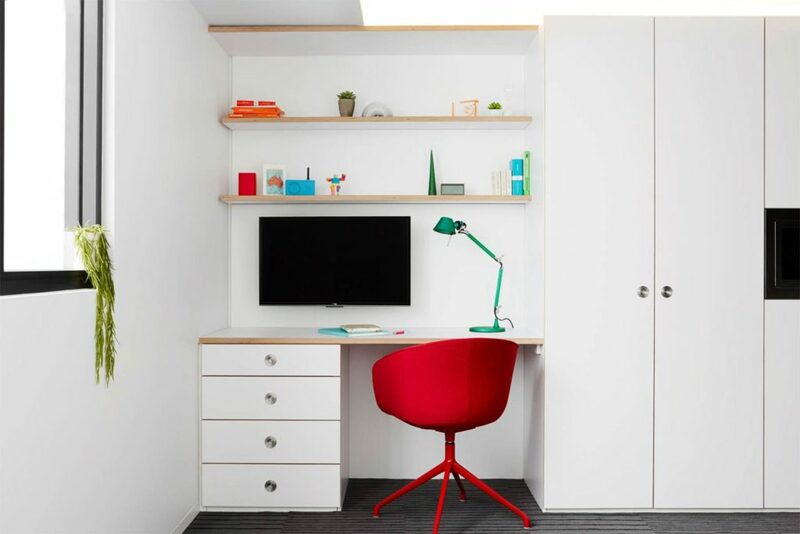 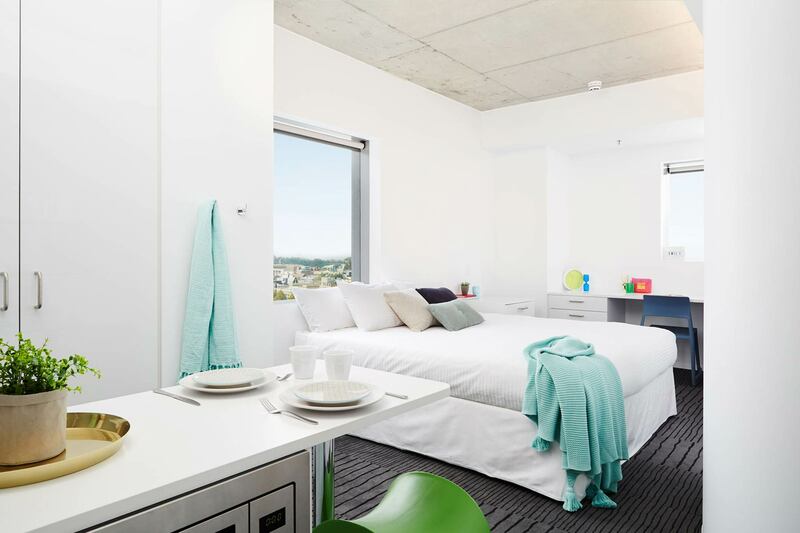 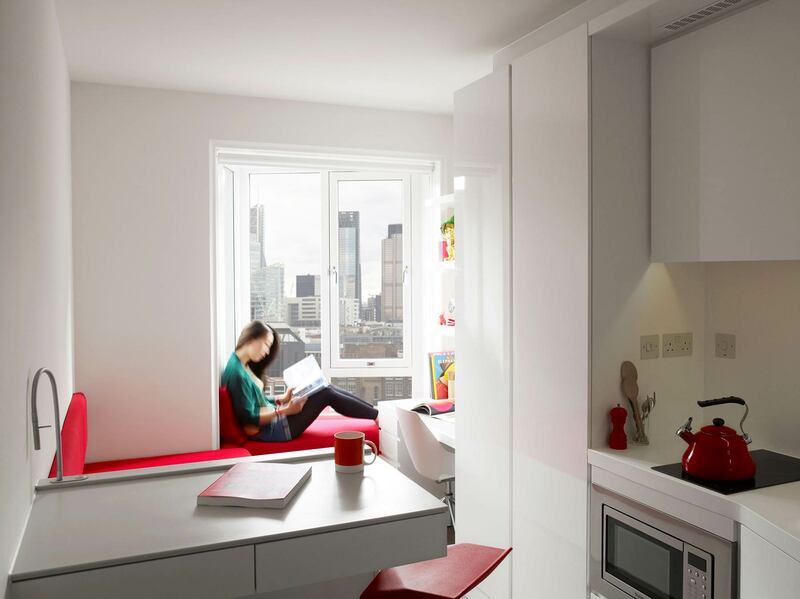 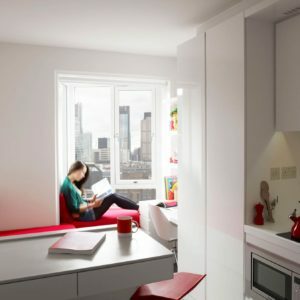 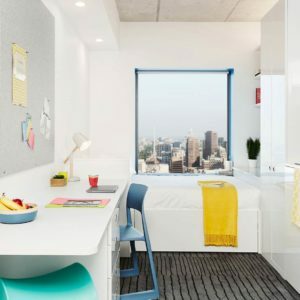 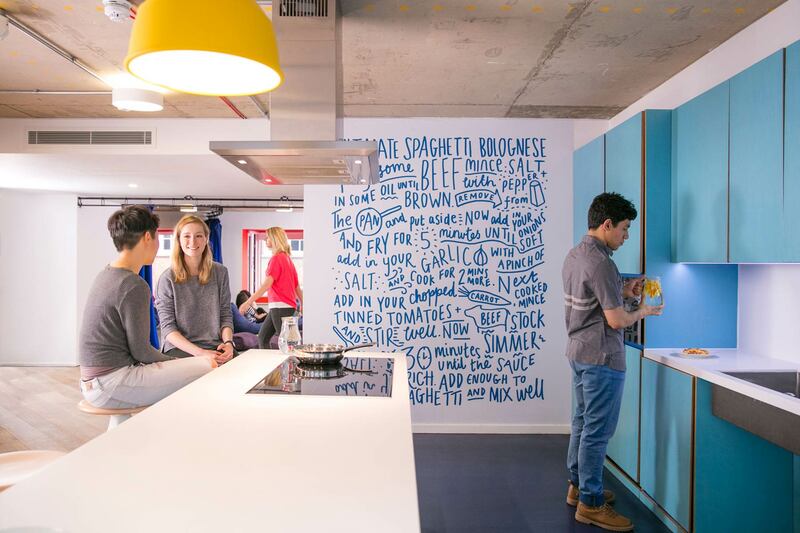 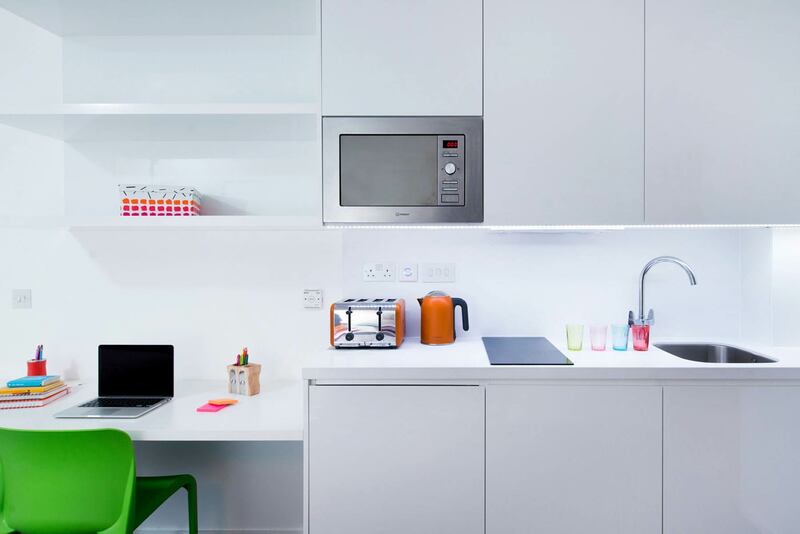 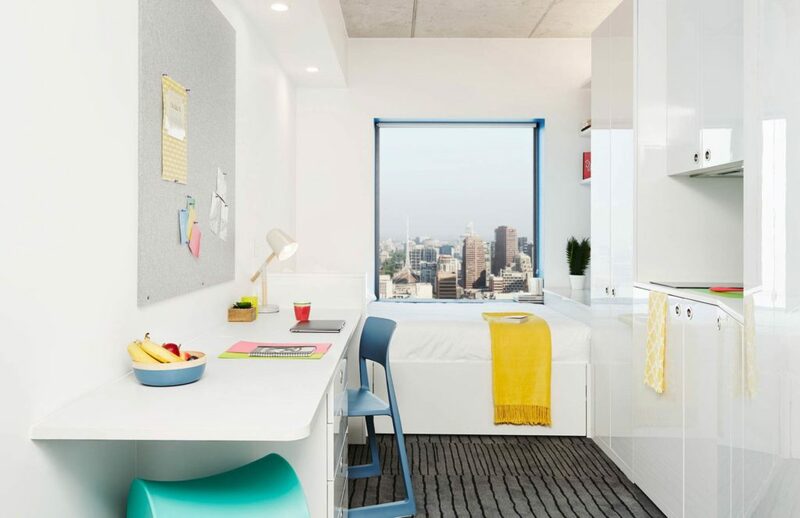 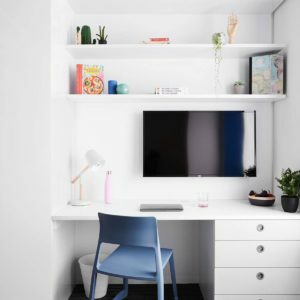 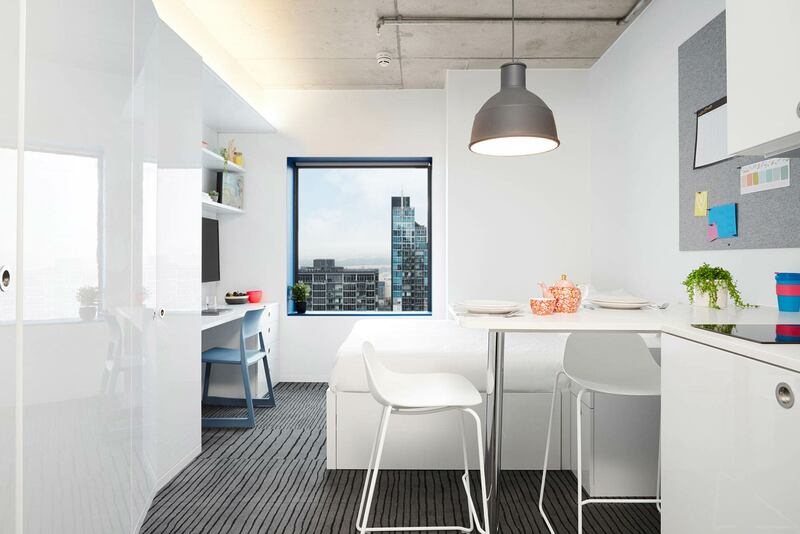 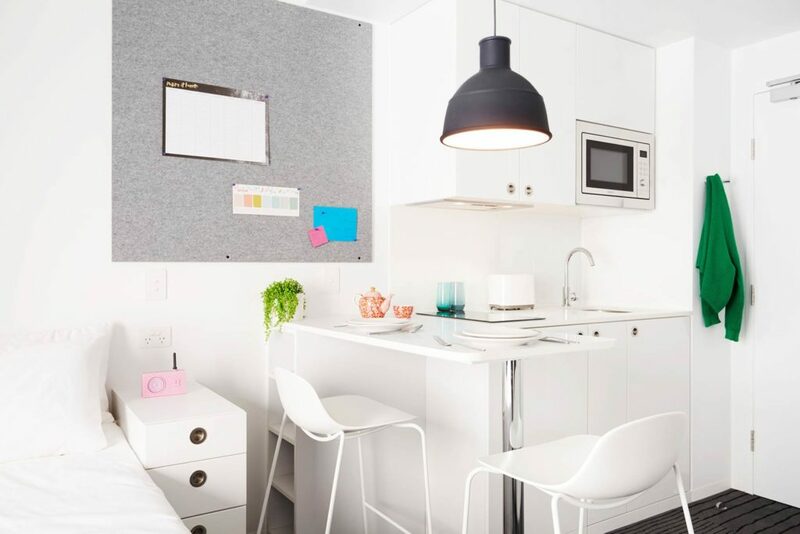 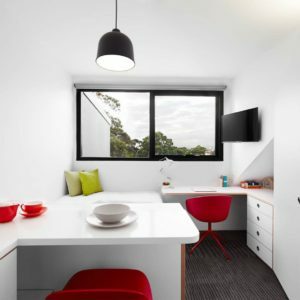 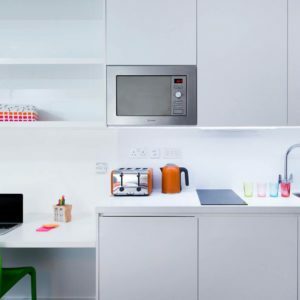 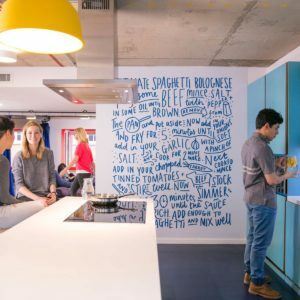 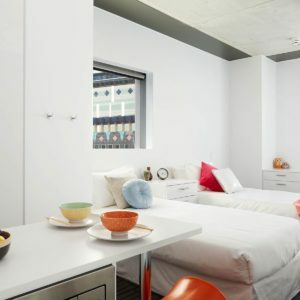 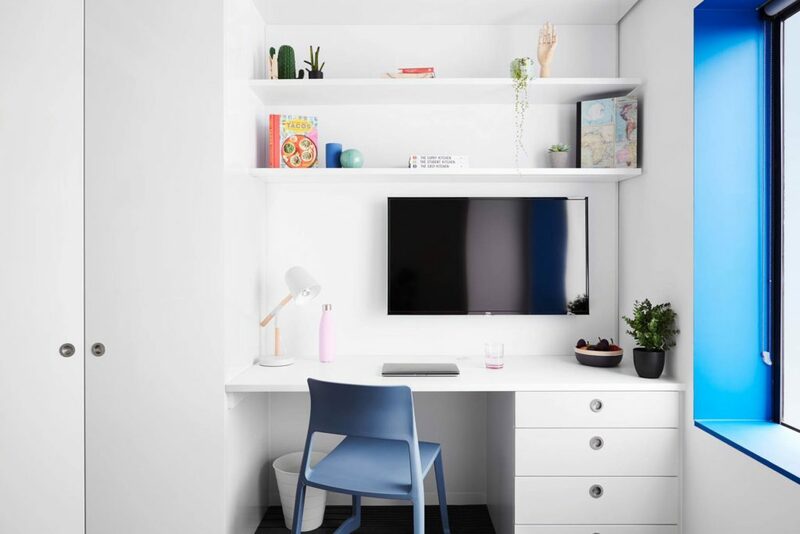 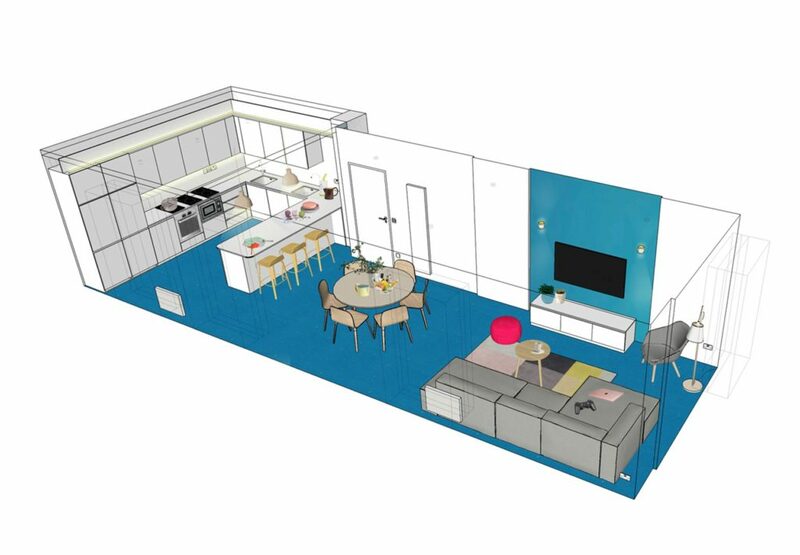 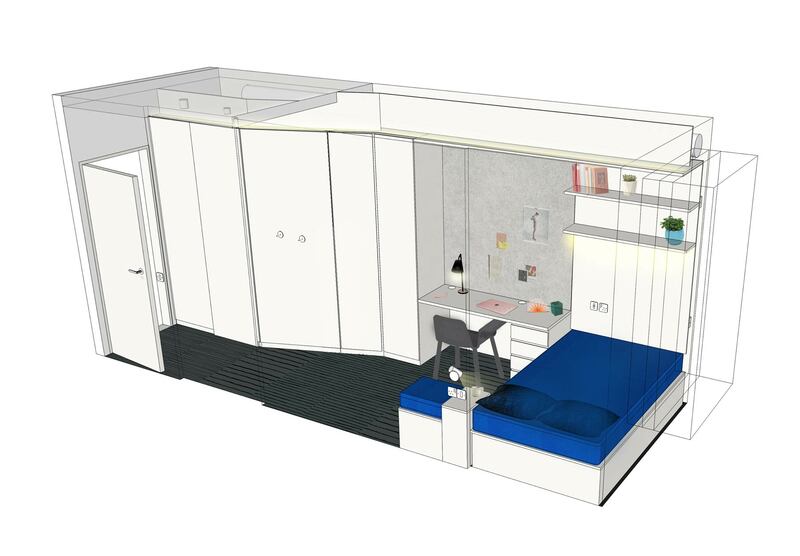 Brief: To create a highly designed, super functional living environment for students, a compact apartment efficient to produce and delightful to live in accompanied by communal areas where students can come together to study, socialise, exercise, eat, drink, learn and live. 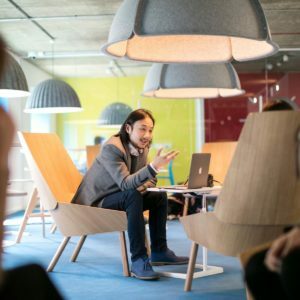 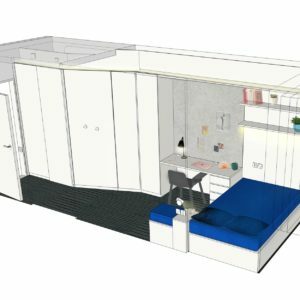 The Scape Room: Using industrial design as a methodology, we explored submarines, yachts, planes and caravans to unlock our approach to compact living. 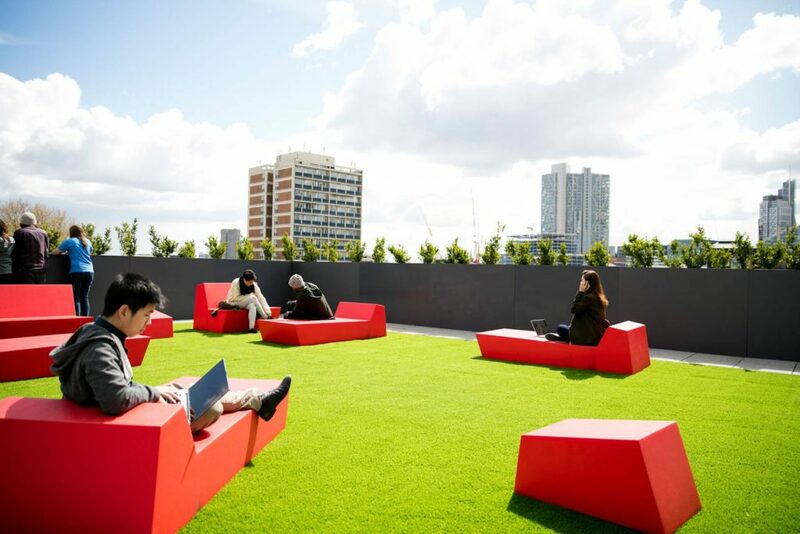 We liberated all lost voids, taking nothing for granted and ensuring no space was wasted. 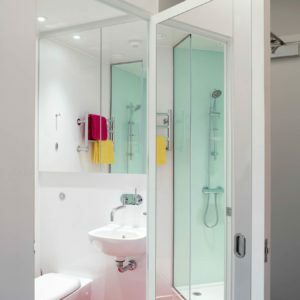 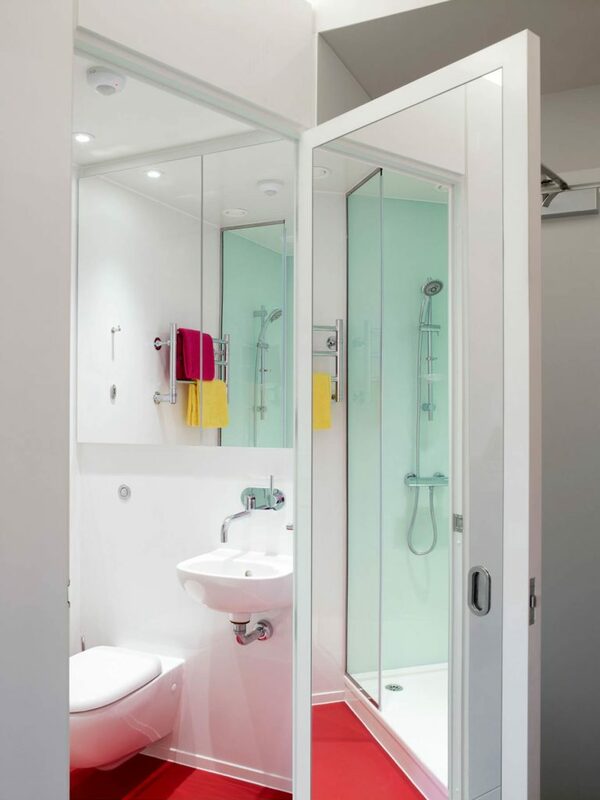 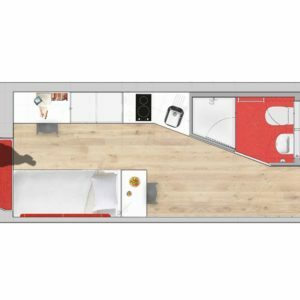 Each room was designed as a single entity starting at 13.5m2 with prefabricated bathroom pods plugged in. 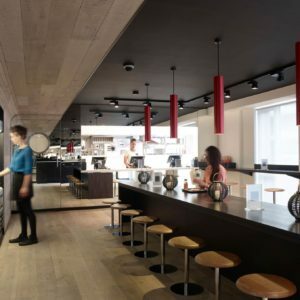 Over time the design has evolved, growing and improving through what we have learnt from each new site while maintaining the original principles of efficiency and poetry. 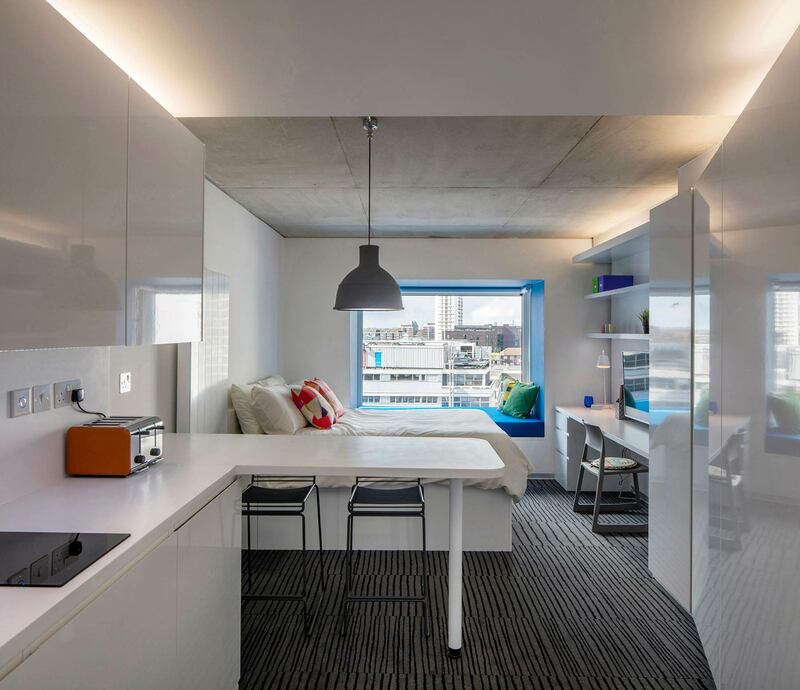 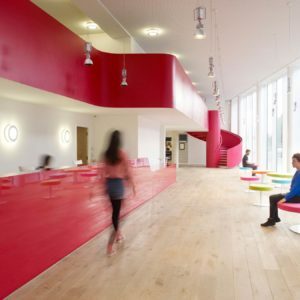 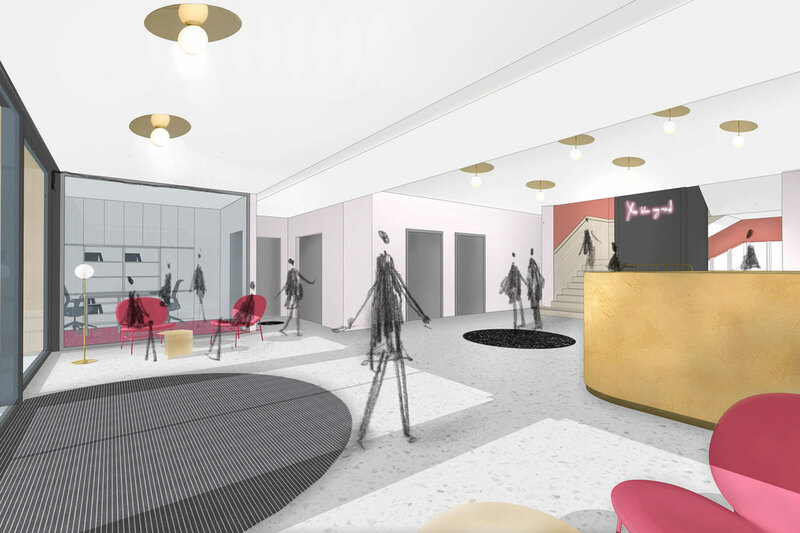 The range of room typologies has expanded over time, creating a diversity of products within each Scape building that allows them to respond to a wider spectrum of student needs. 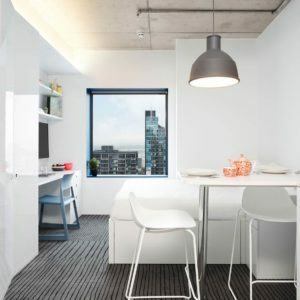 The rooms are orientated to maximize natural light and window views to offer connection to the surrounding area. 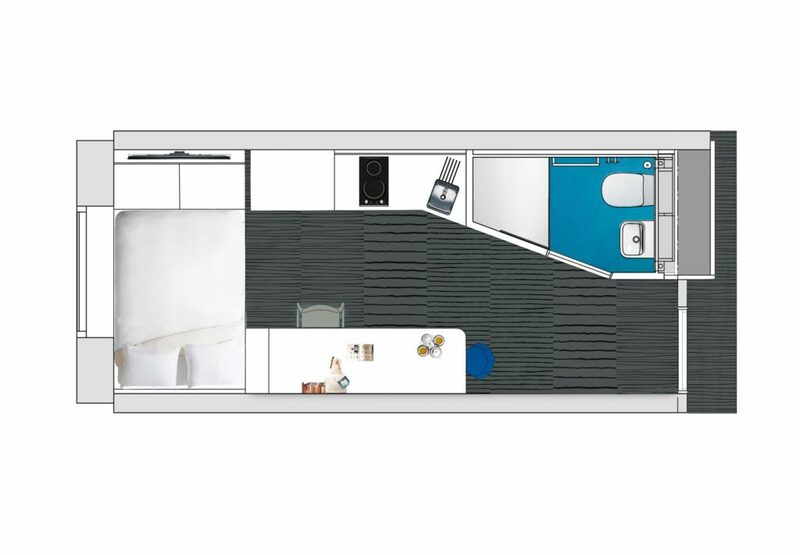 Bedroom Palette: The materiality of the bedrooms is of the upmost importance. 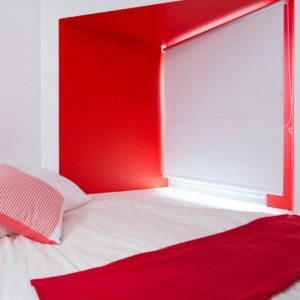 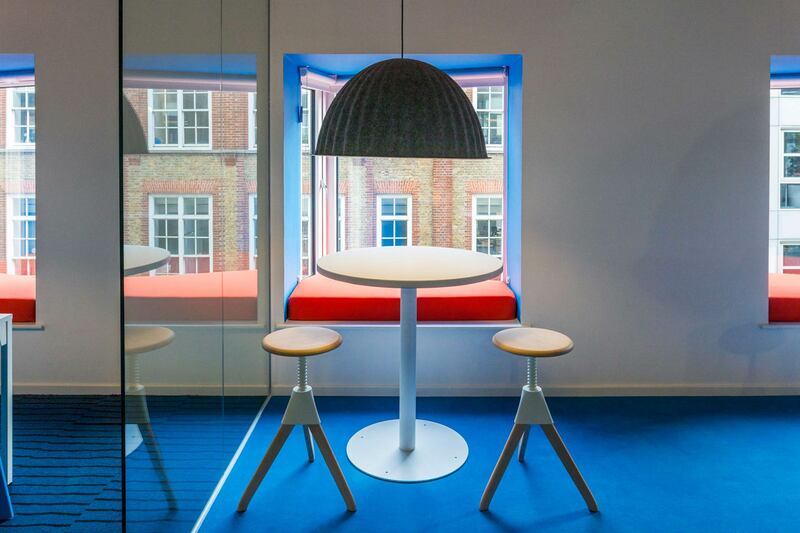 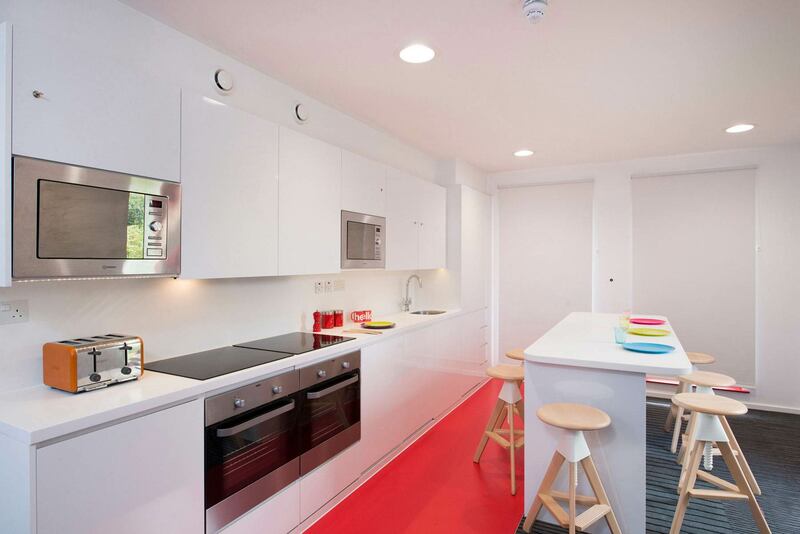 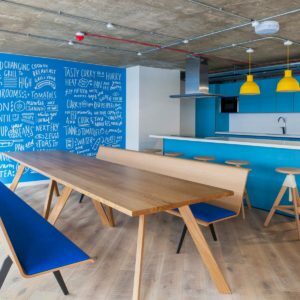 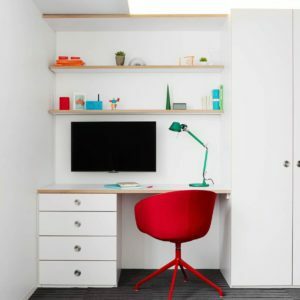 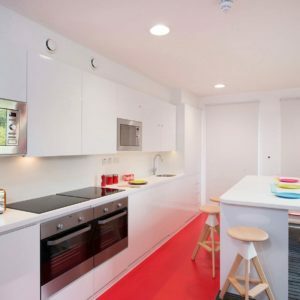 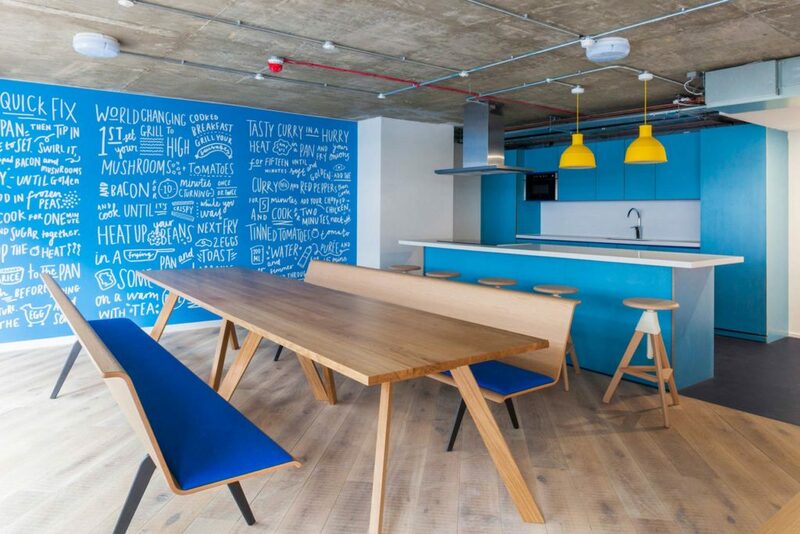 We chose a super light, reflective and tactile palette of materials including bespoke carpet floors, corian worktops, gloss white walls and super functional furniture to maximize the emotion of space, while playful touches of vibrant colour create a sense of bold simplicity and sophistication. 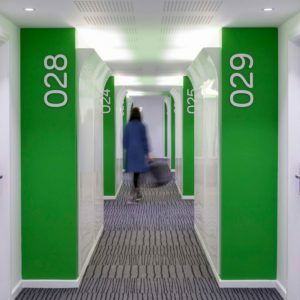 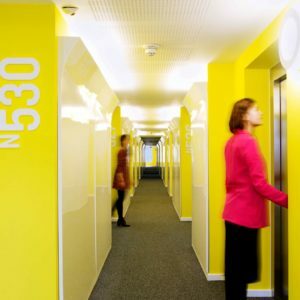 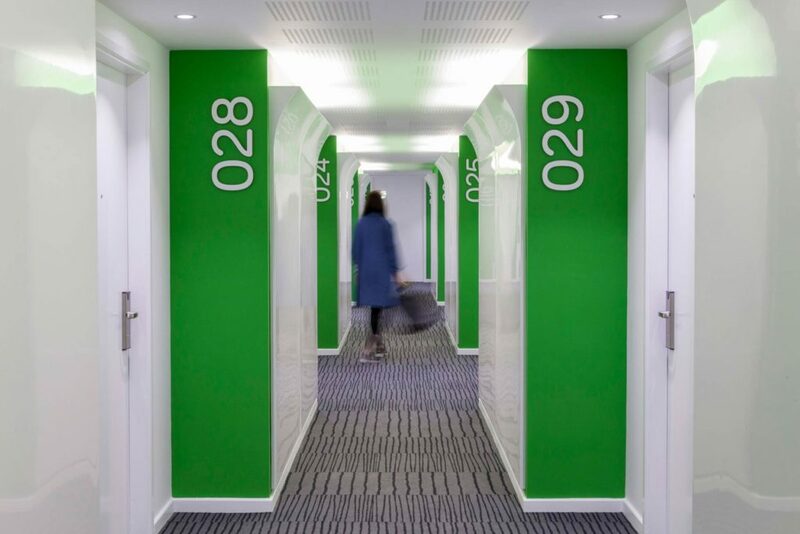 Corridors: Corridors are colour coded, both to improve wayfinding and to support the wider Scape identity. 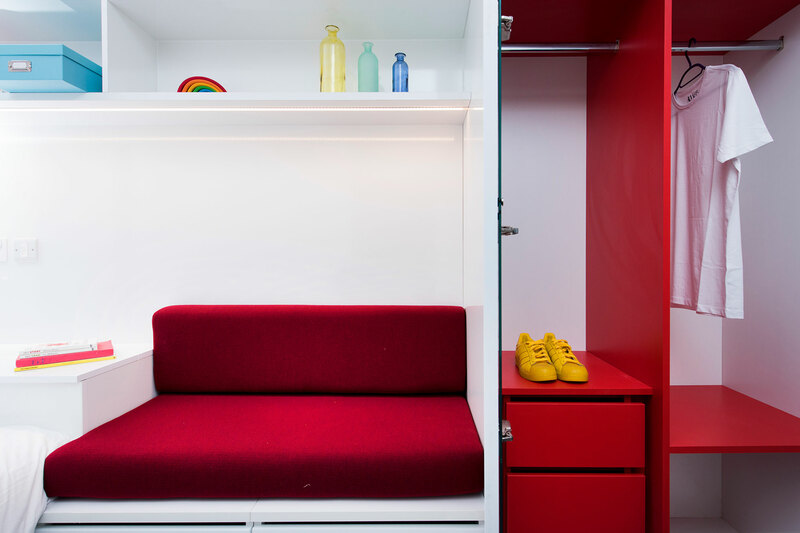 We celebrated the risers, expressing their form to break up the linearity of the corridors and allow access for maintenance without disturbing the student’s privacy. 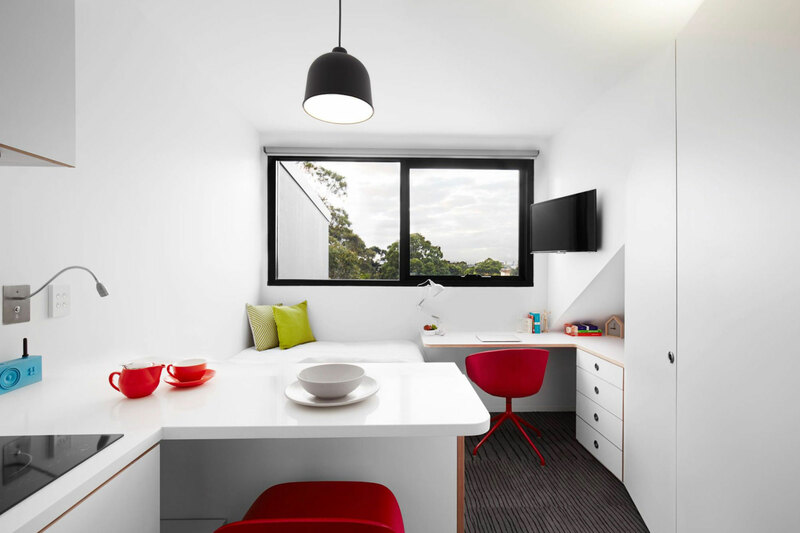 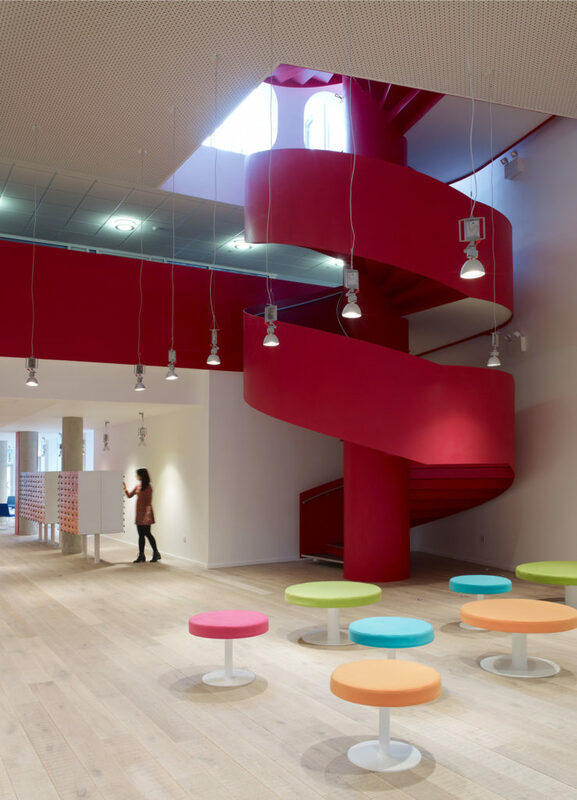 Light is thrown up on the ceilings to make the spaces feel as open and vibrant as possible. 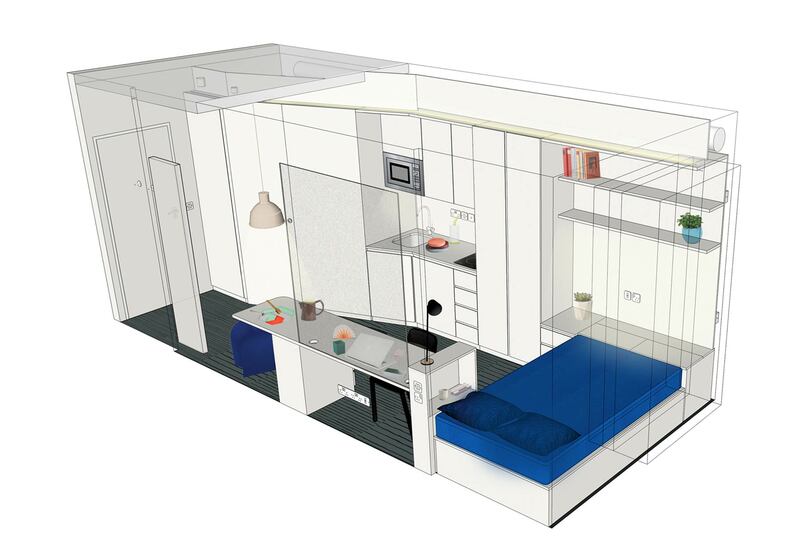 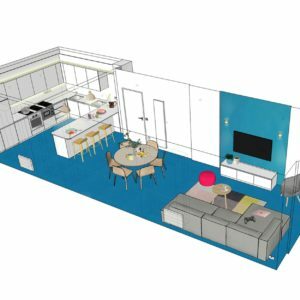 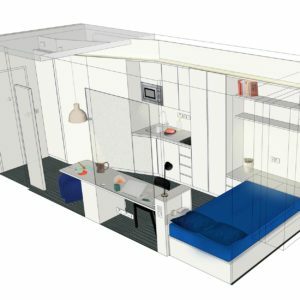 Common Areas: These super sized living spaces are an essential part of the eco-system, representing a home from home for students. 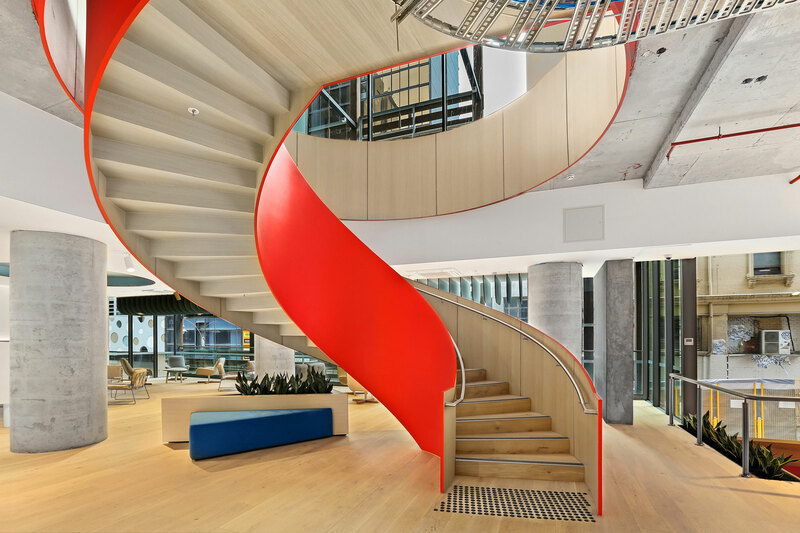 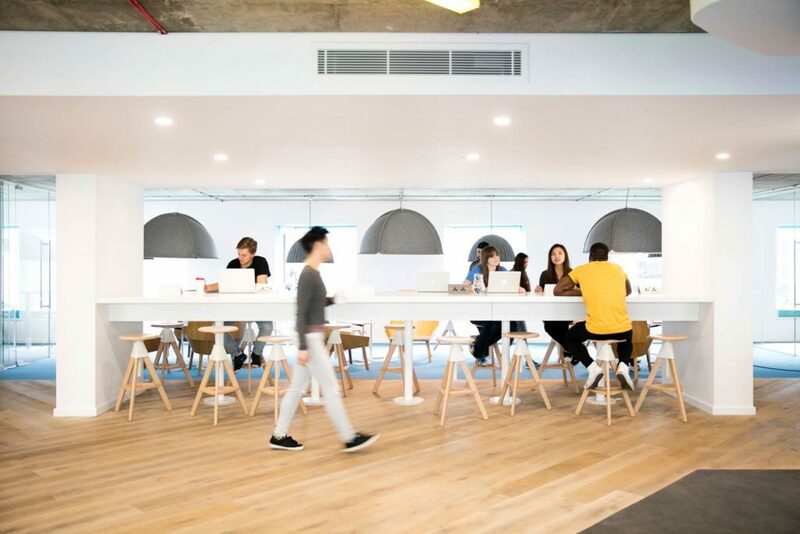 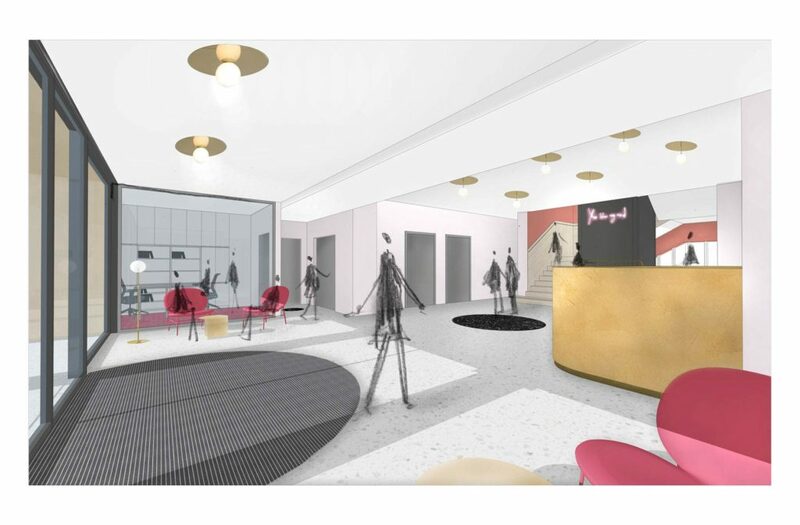 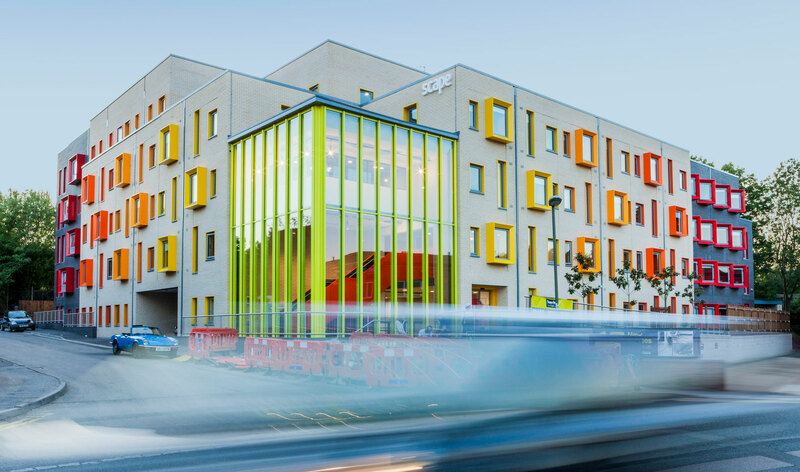 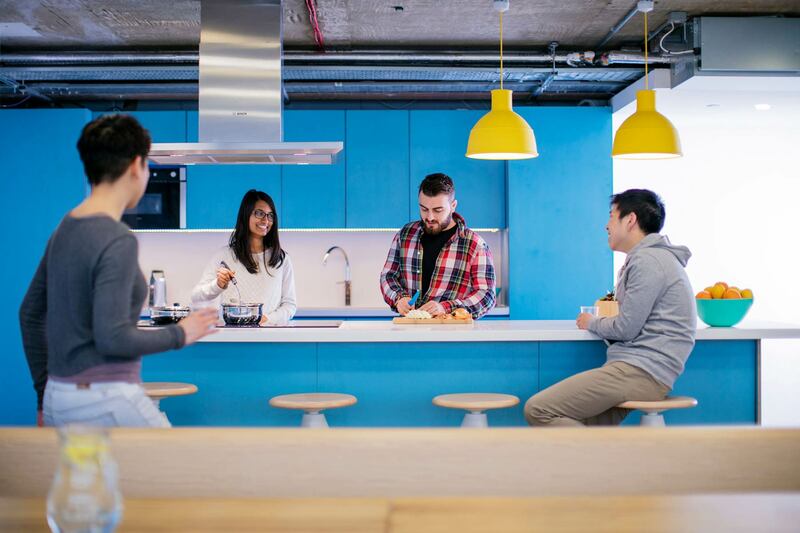 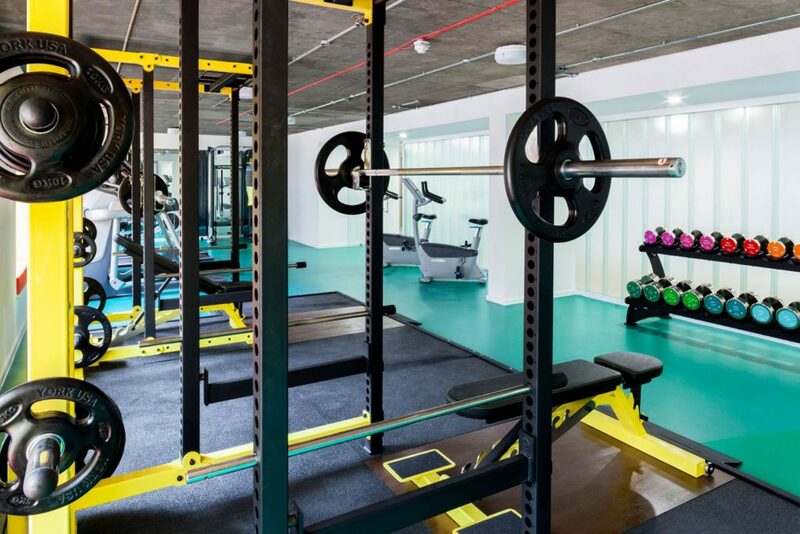 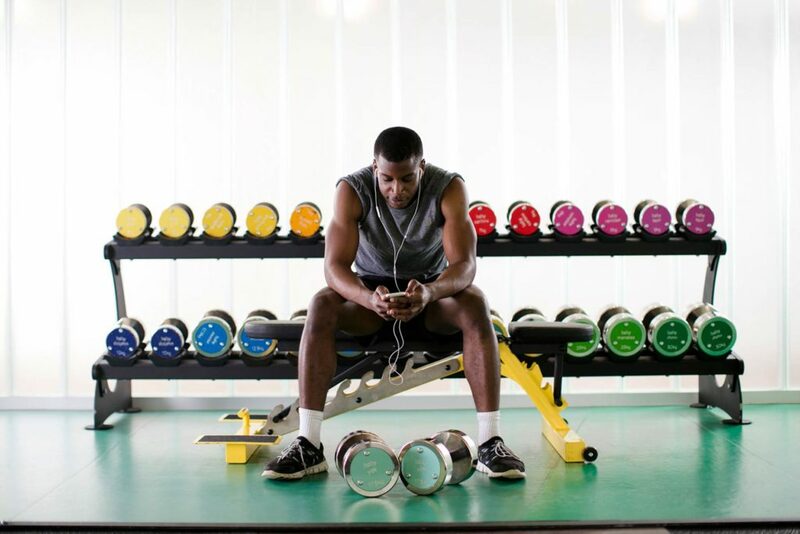 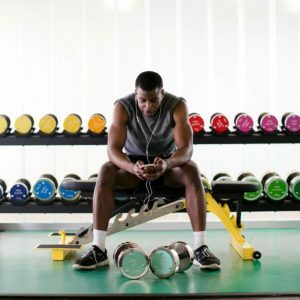 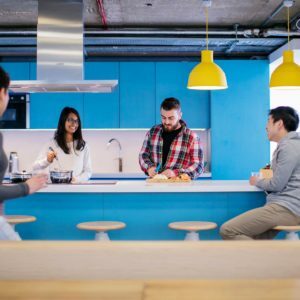 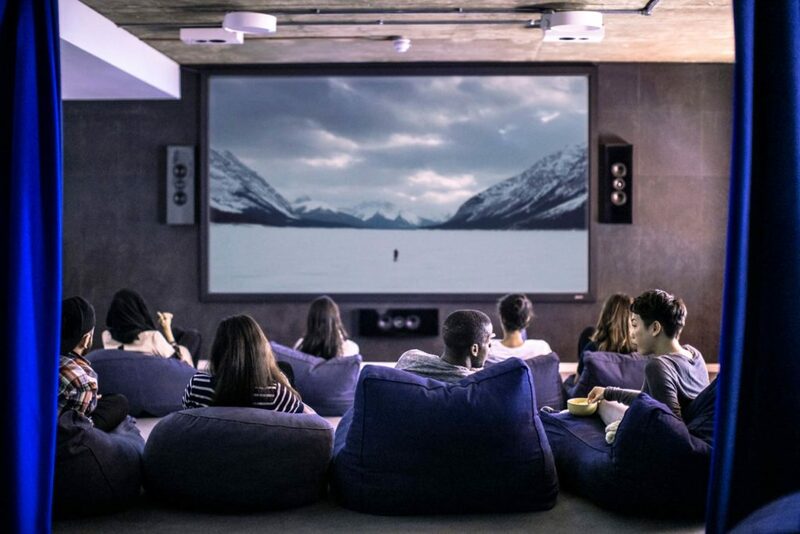 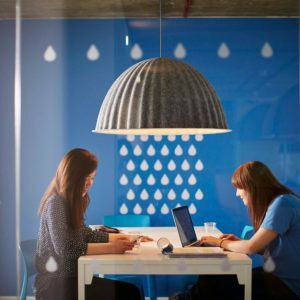 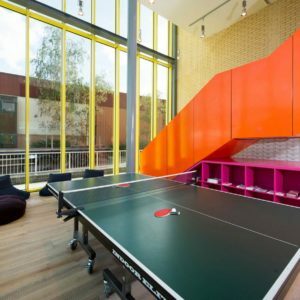 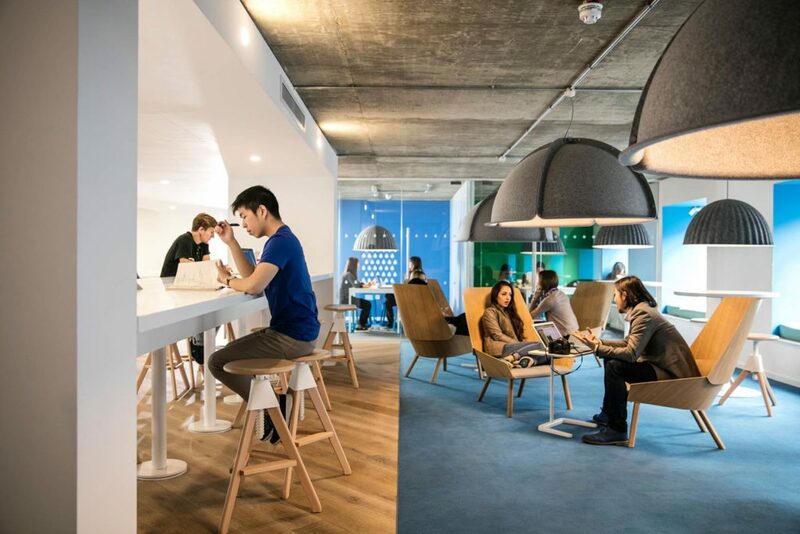 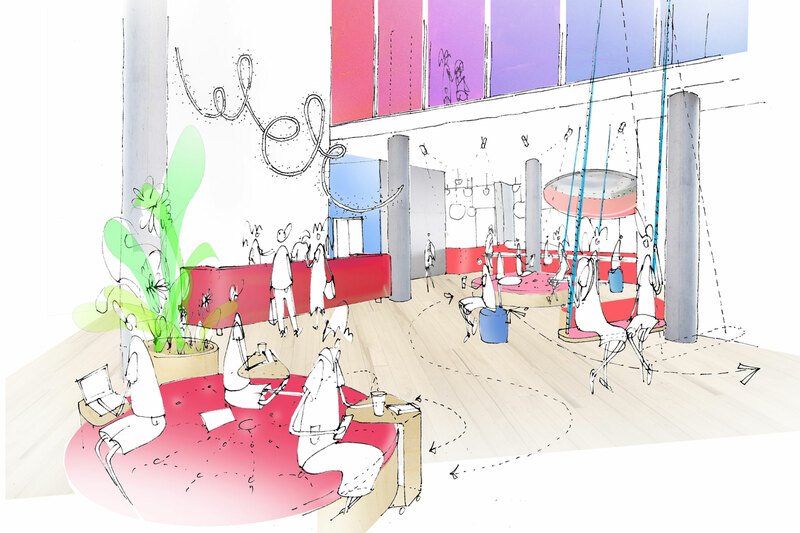 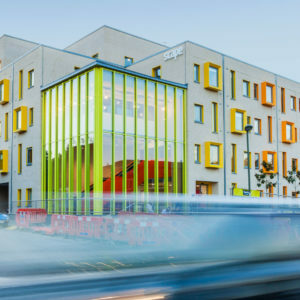 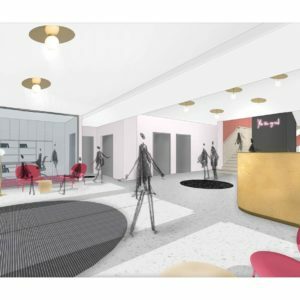 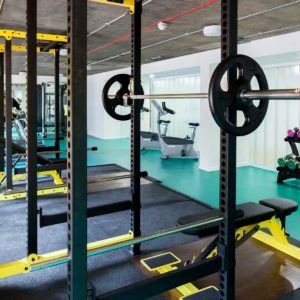 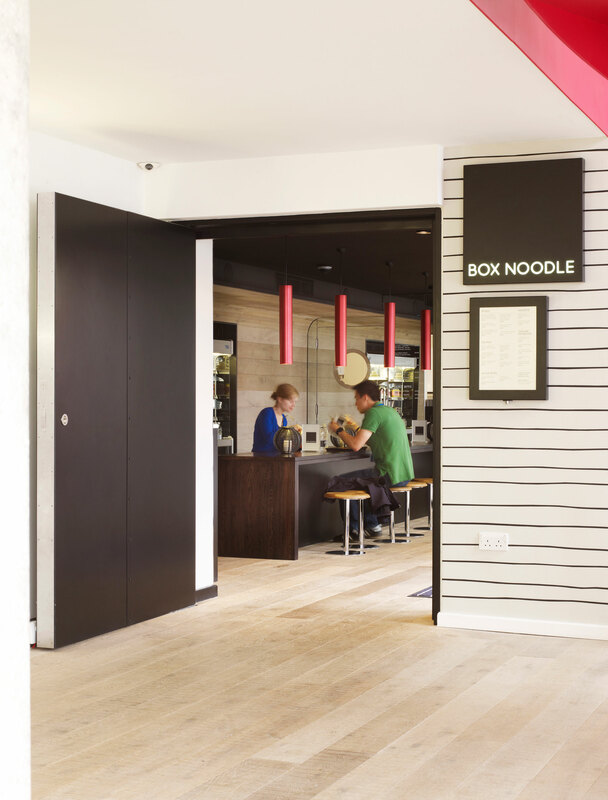 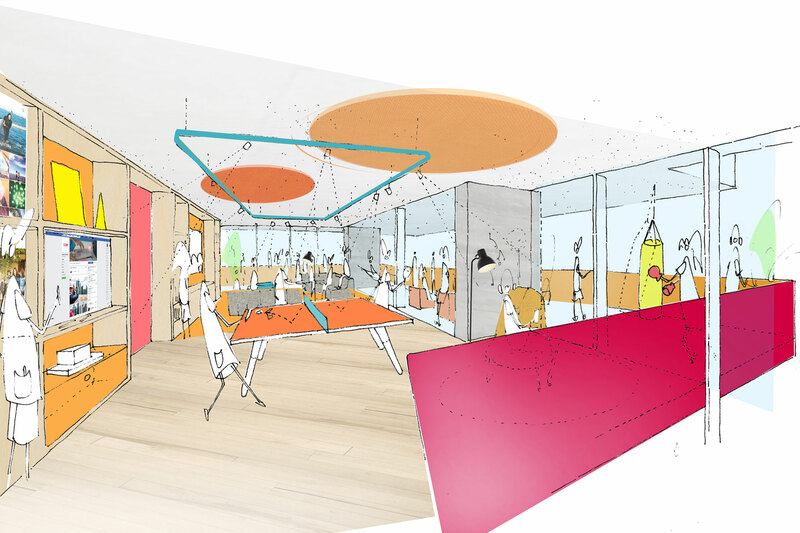 Inspired by public architecture, the wide range of social amenities, offered across a programme of shared spaces – communal kitchens, study areas, lounges and game rooms, gym, cinema etc. 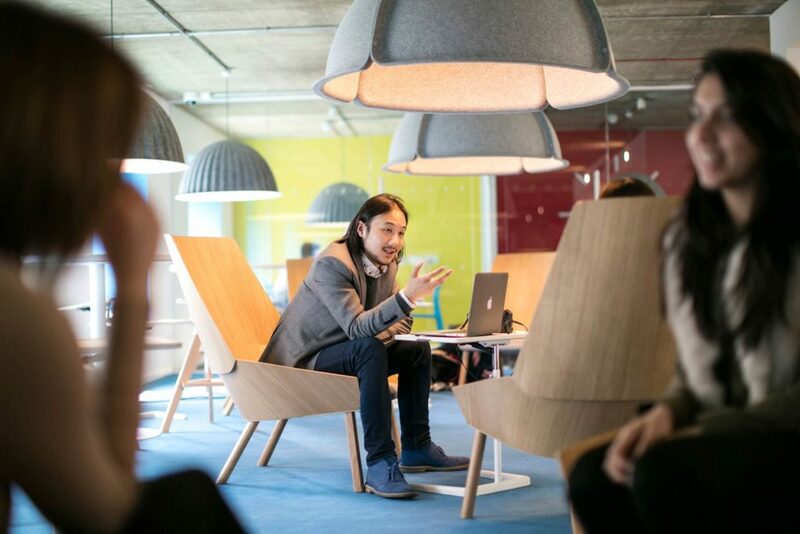 – seek to engage the user creating a wide range of opportunities for interaction. 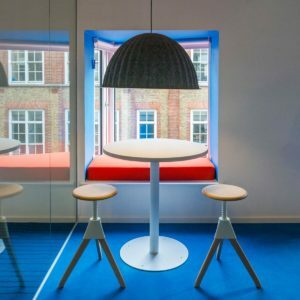 We used fixed furniture as landmarks in dialogue with an eclectic collection of moveable elements to create zoned areas loosely containing different activities, keeping boundaries blurred to maximize flexibility and responsiveness while establishing a sense of connection, openness and free flow of light. 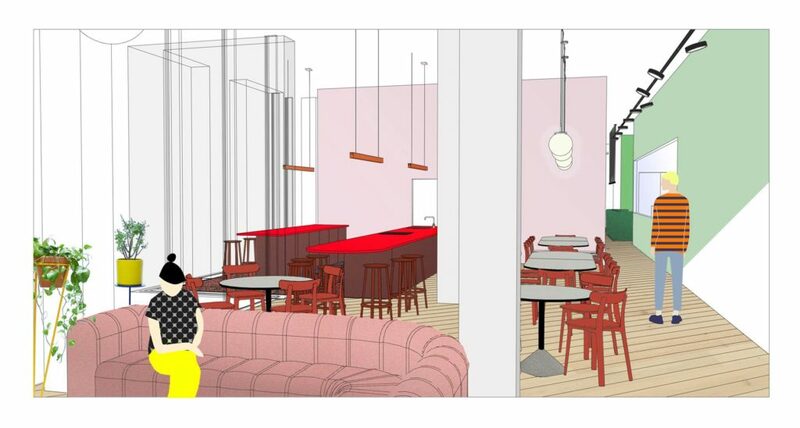 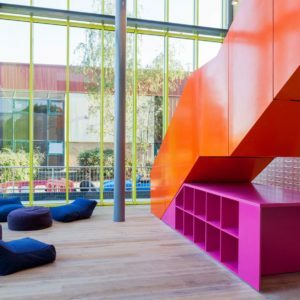 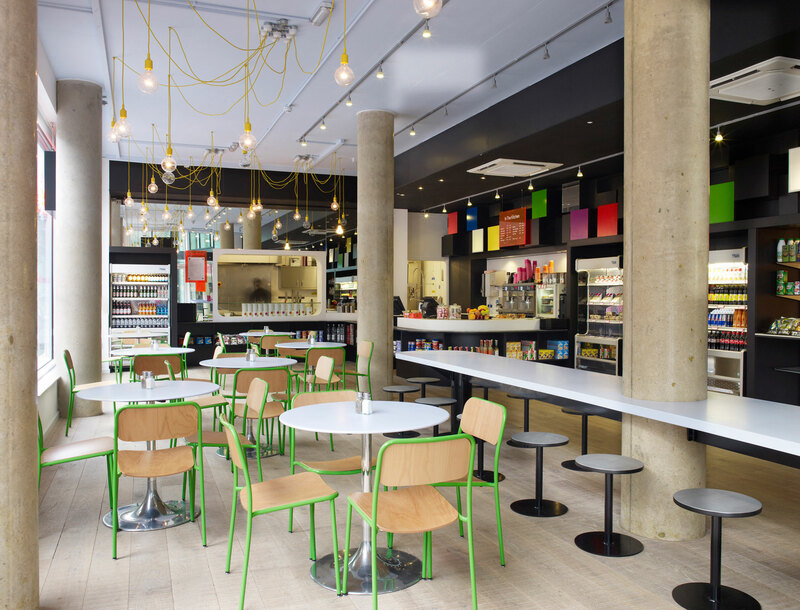 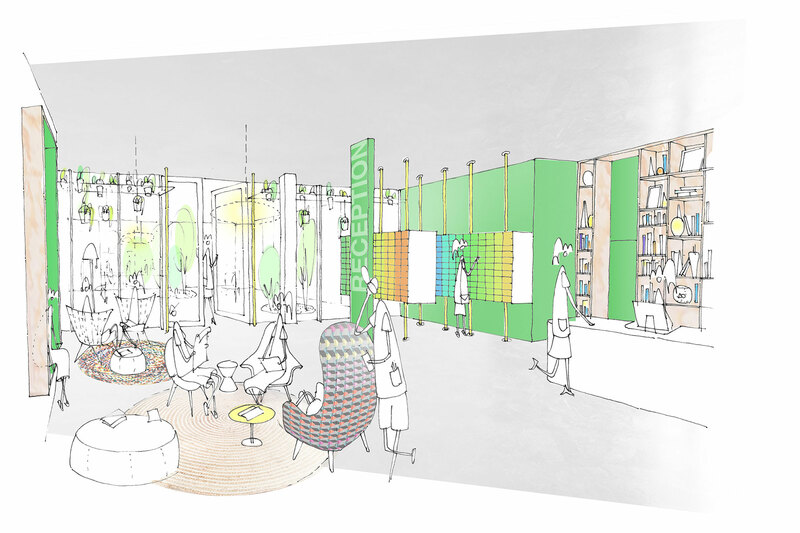 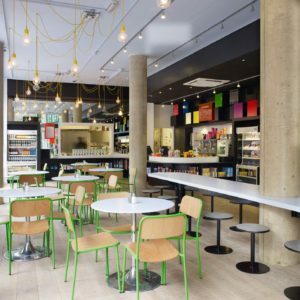 Common Area Palette: In these high-traffic shared spaces we have developed a palette of hardwearing industrial finishes – exposed concrete, rough sawn timber and ply wood, enlivened by pops of colour and vibrant graphics – to build a creative narrative in sympathy with the students. 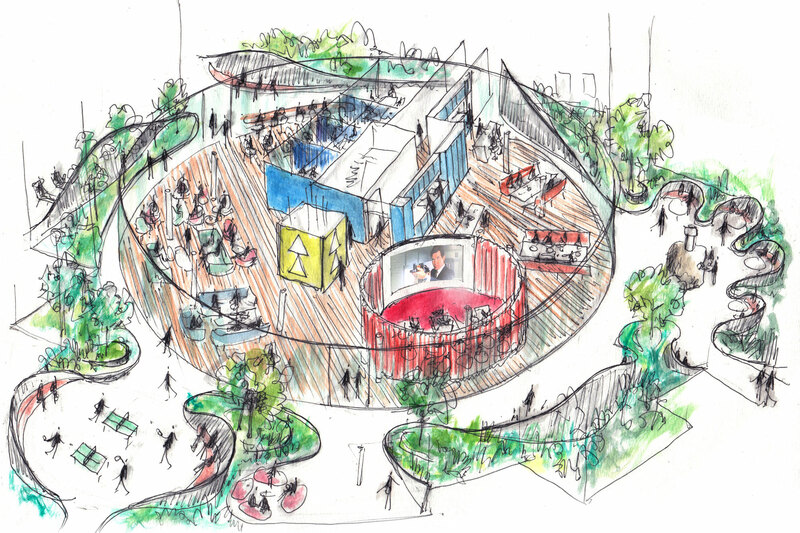 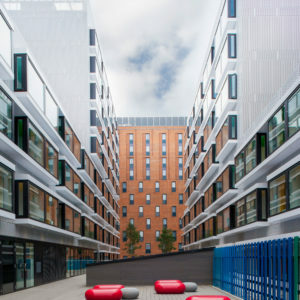 Scape Commercial spaces: To balance this hyper-functional approach to compact living we developed a broader eco system of generous, engaging social spaces, to help build a sense of community and allow students to decompress. 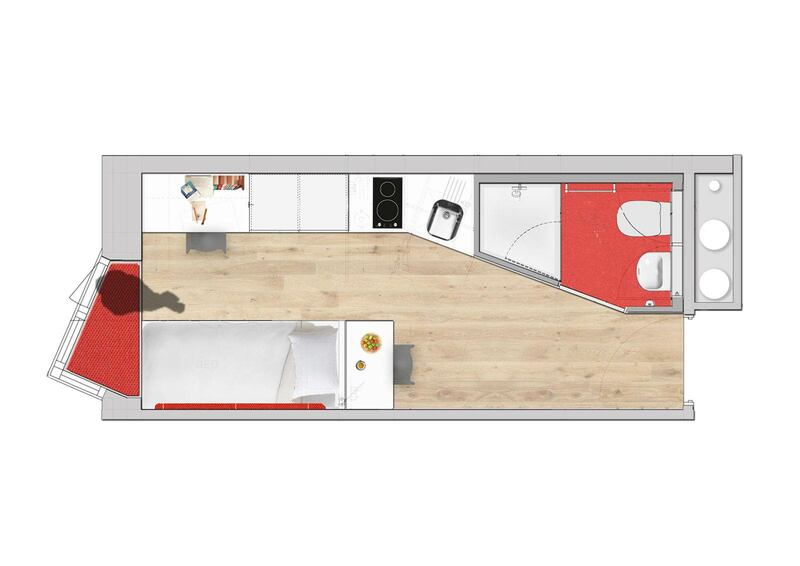 There is provision for accommodation of commercial clients in the base of the building. 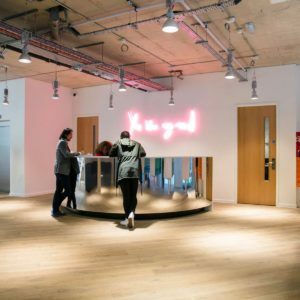 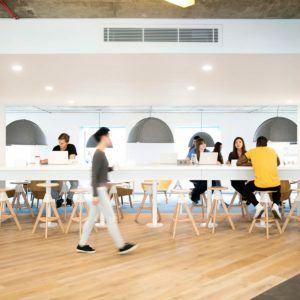 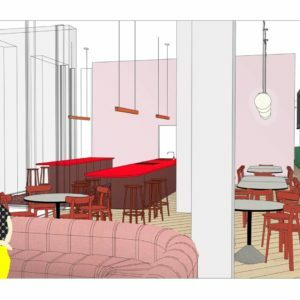 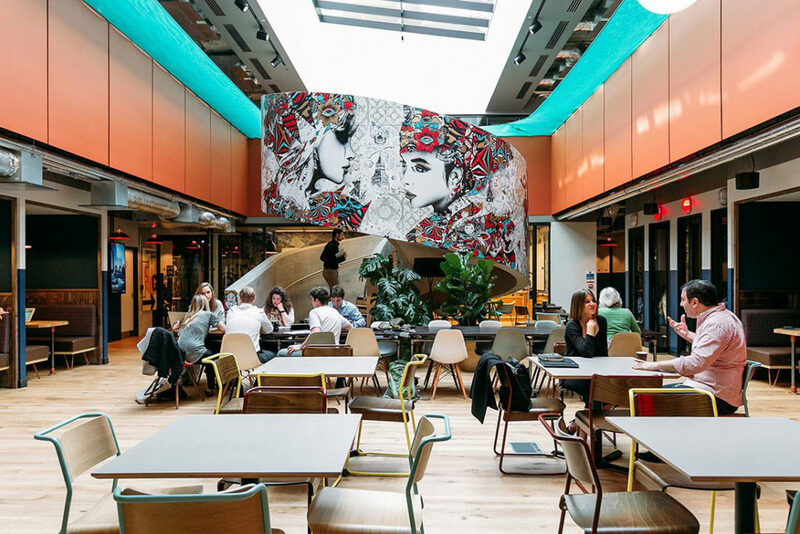 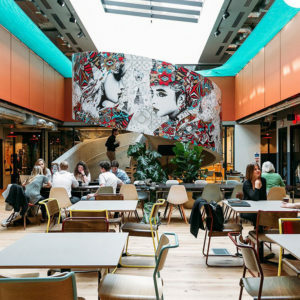 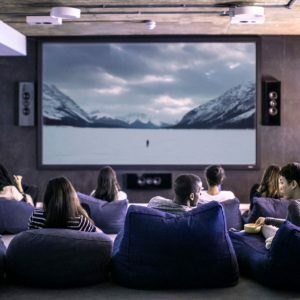 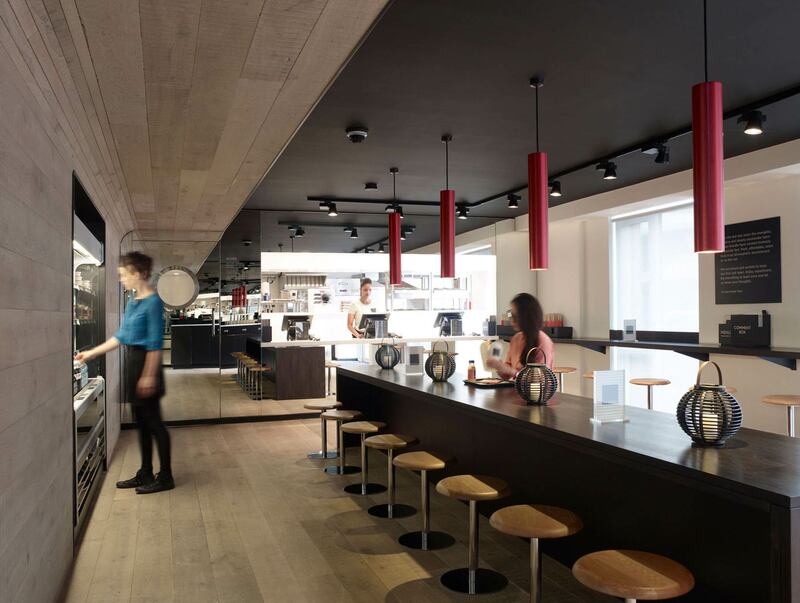 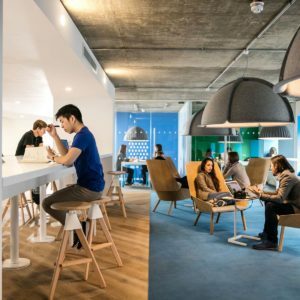 Whether restaurant, retail or shared workspace these are curated specifically to appeal to the students so that all may live and work together symbiotically. 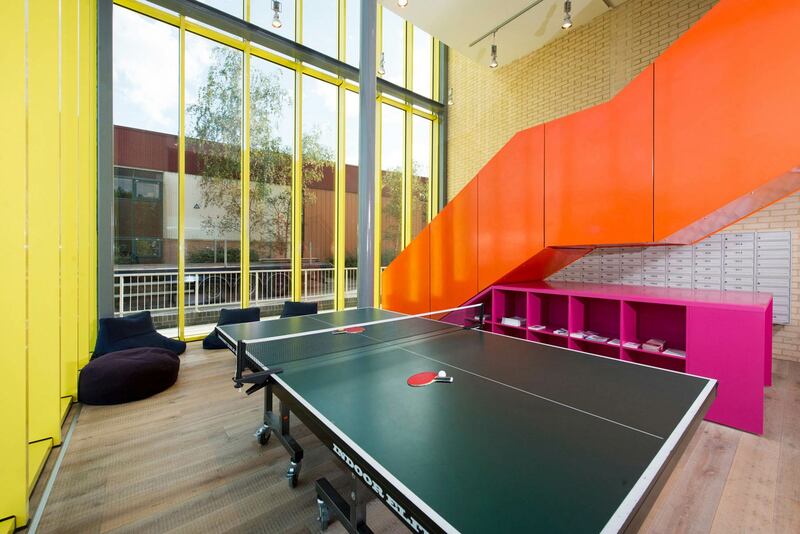 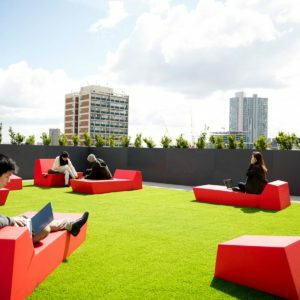 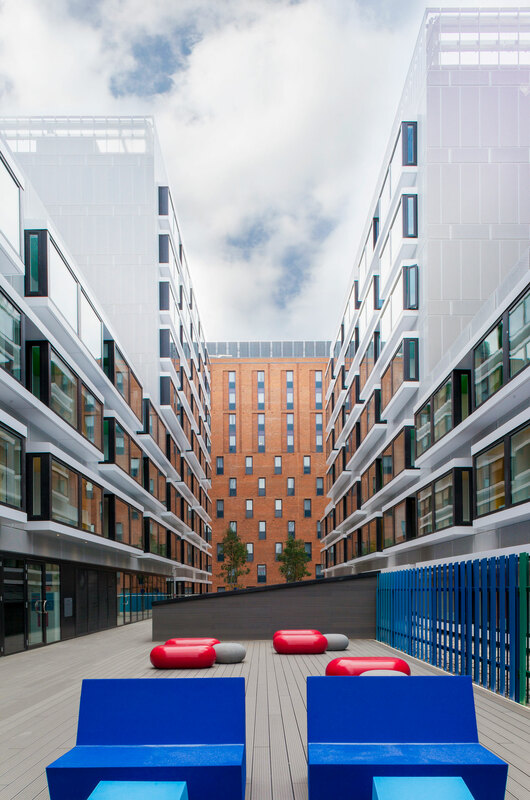 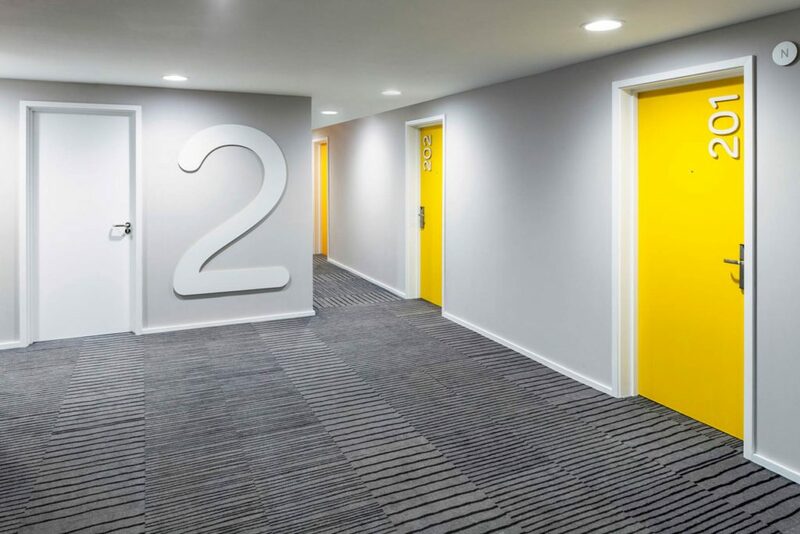 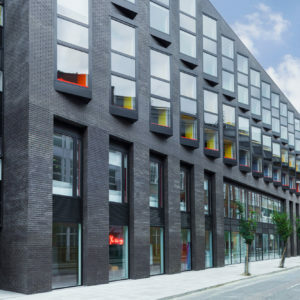 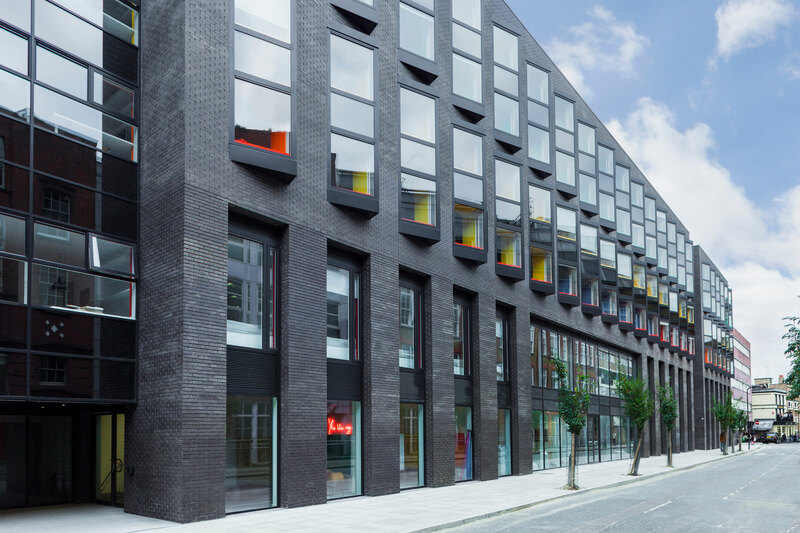 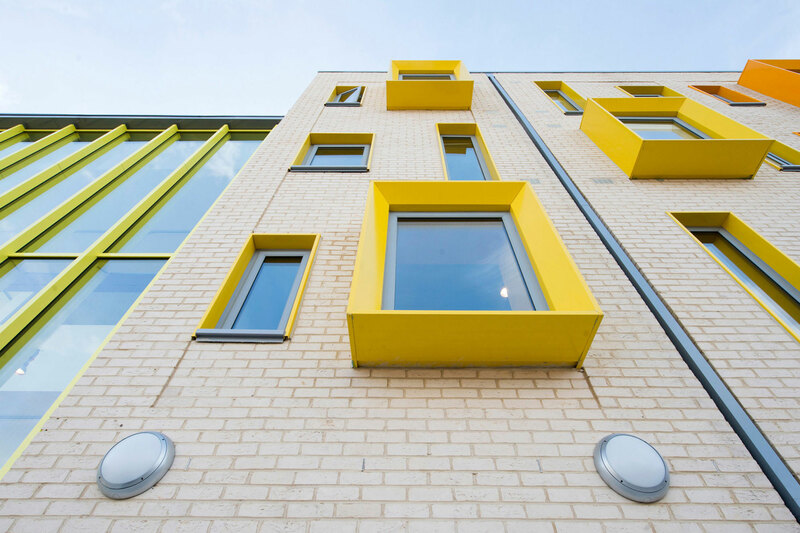 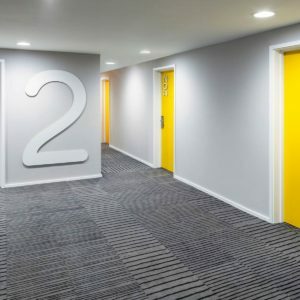 We have worked with Scape on the development of their student accommodation offering since it was born 2009. 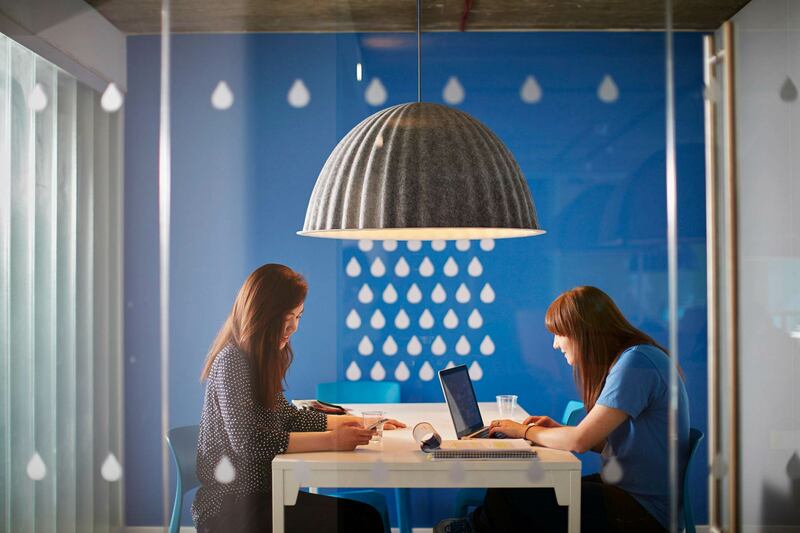 In close collaboration with the client, branding agents Praline, who created the original brand identity, and now That Thing who are responsible for its evolution, we have helped established all key elements of the concept from architecture to graphics – including the name – refining the seamless, fully integrated-user experience that is now central to the brand. 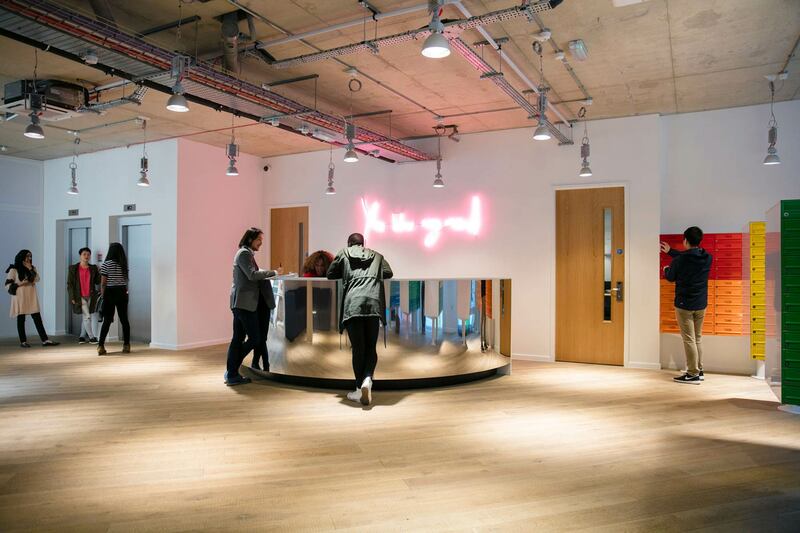 This long-standing engagement has seen us become custodians of the brand, helping to select architects and designers for future collaborations and overseeing consistent delivery of a high level of quality throughout its international journey. 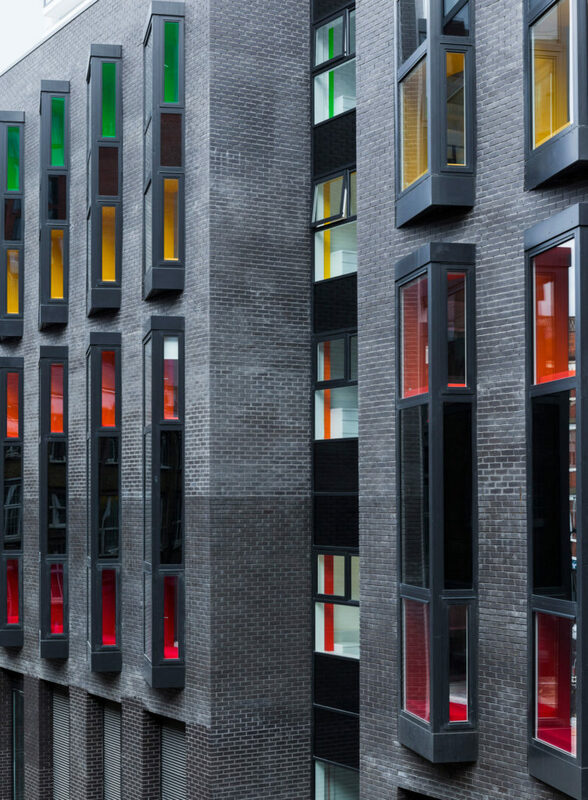 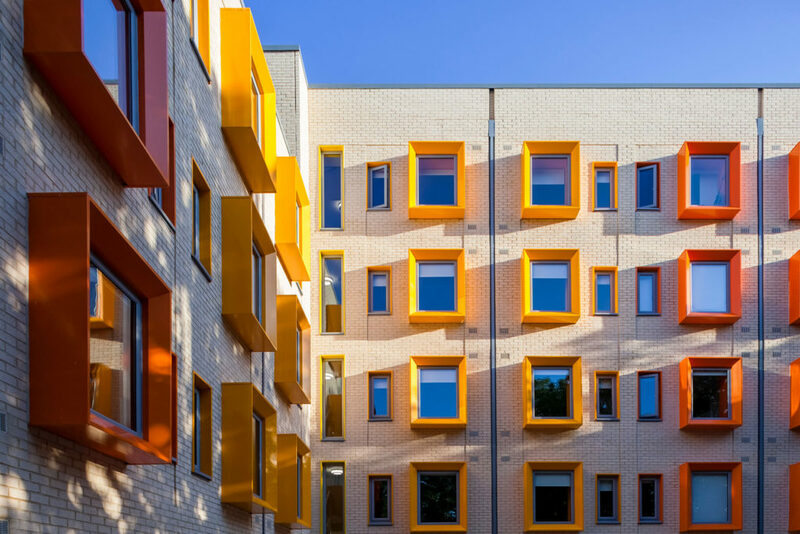 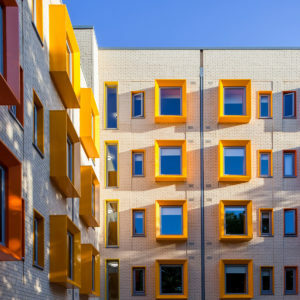 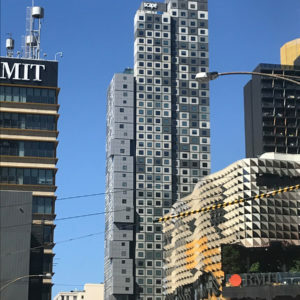 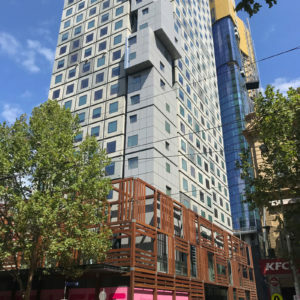 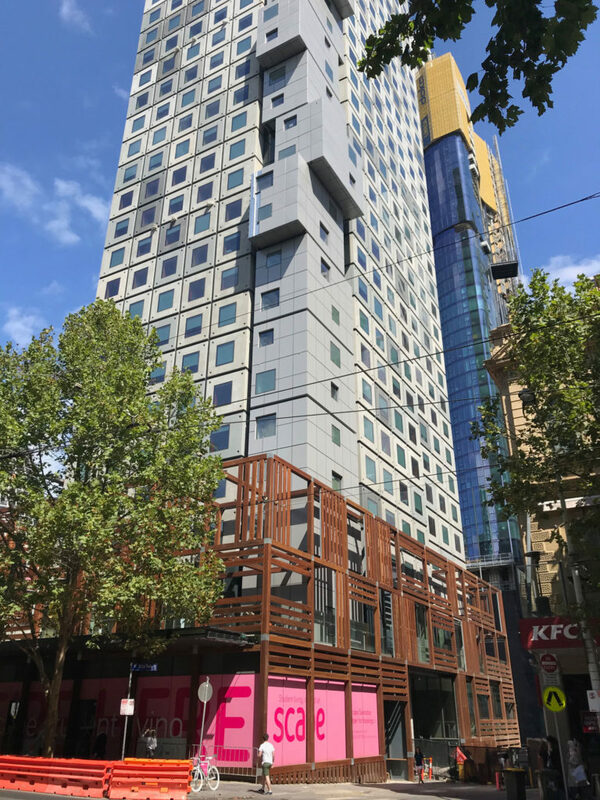 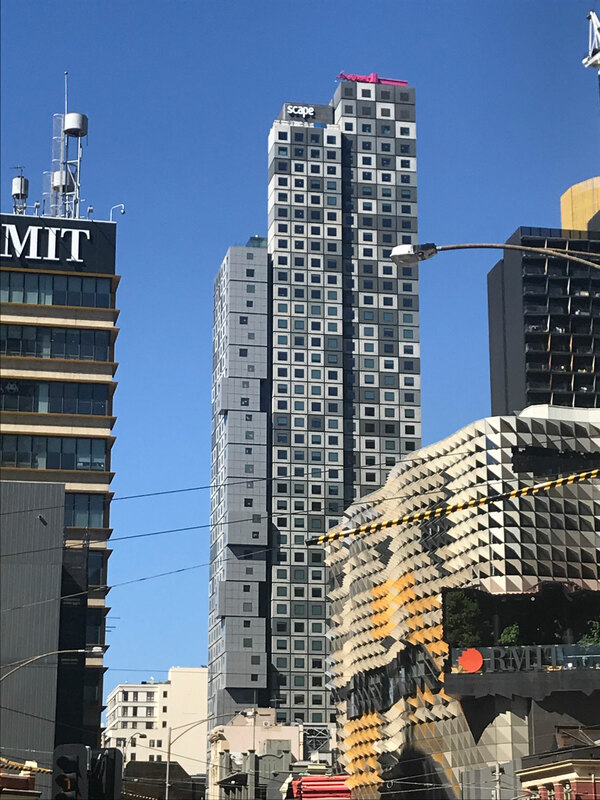 Every new site presents a different set of challenges – testing and strengthening the scheme to ensure its design solutions work equally well whether located in a new or existing building, a low rise or an urban tower block. 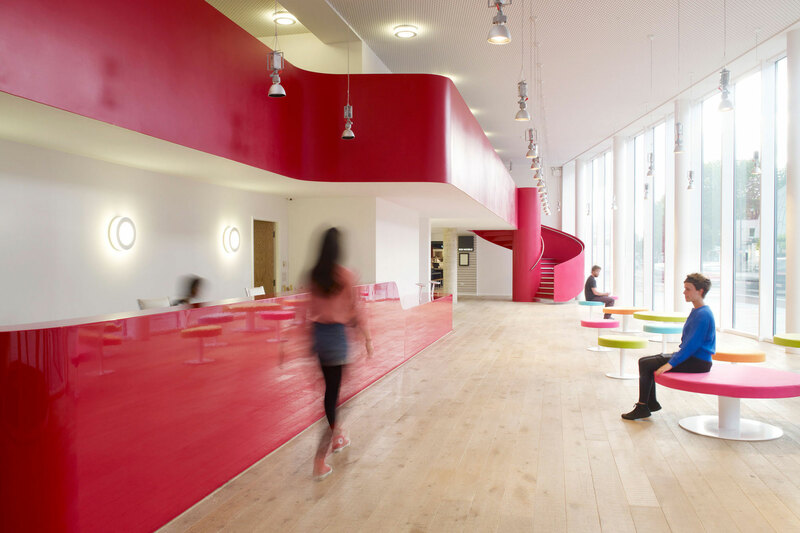 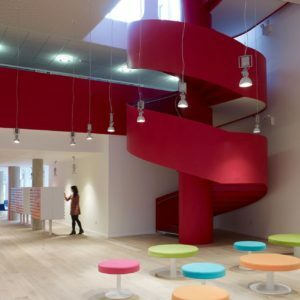 Each building has its own unique cultural context, which we look to respond to and reference in the interior, using materials, colour palette, furniture, lighting etc. 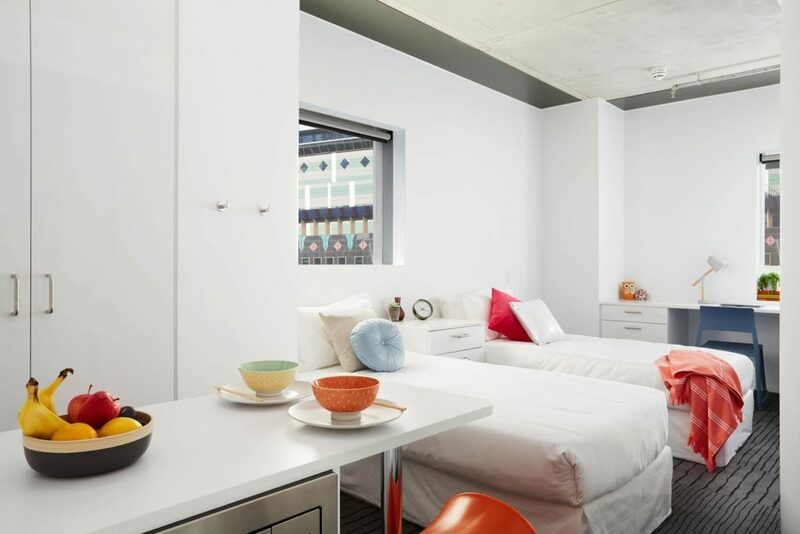 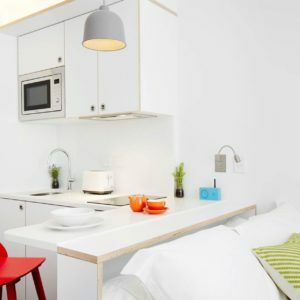 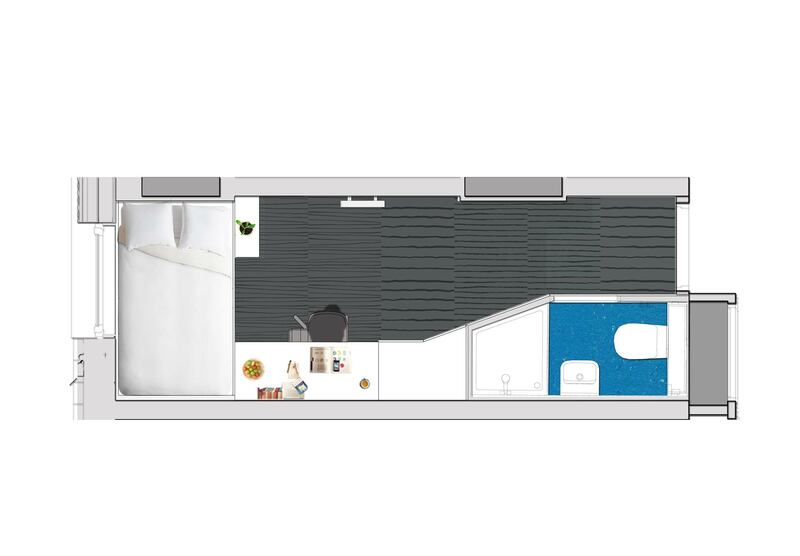 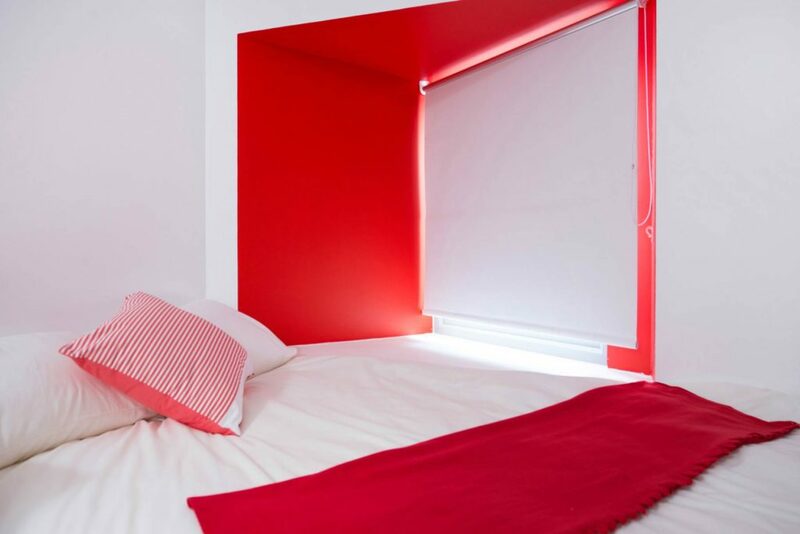 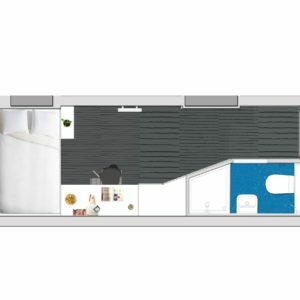 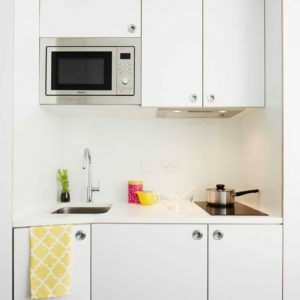 to ensure the accommodation plugs seamlessly into the local scene, incorporating its food, art, music, design etc. 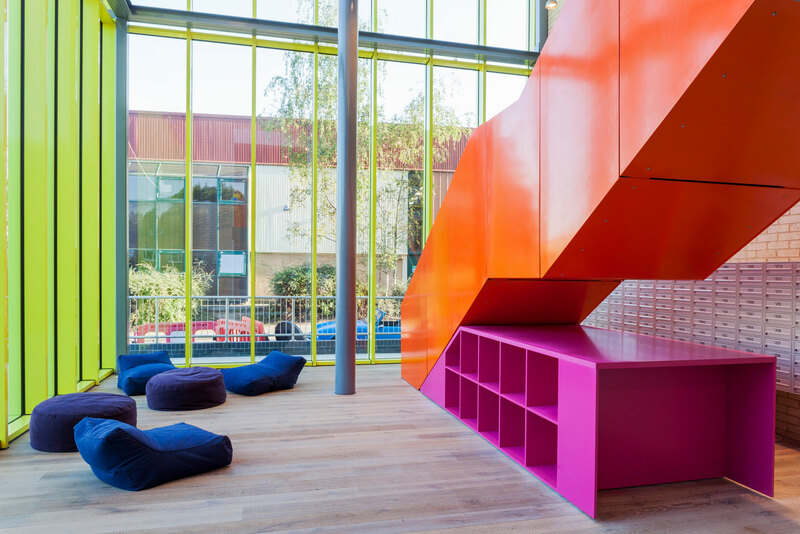 to create a sensitive, relevant landscape for its students to enjoy. 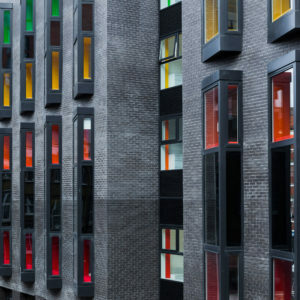 Following our work on Scape’s sites in the UK, Ireland and Australia we are now developing the design for the US market.